Visit www.MendoMeats.com to register. We'll send directions to the pick-up spot in Redwood Valley. Let us know how many birds you'd like to purchase. 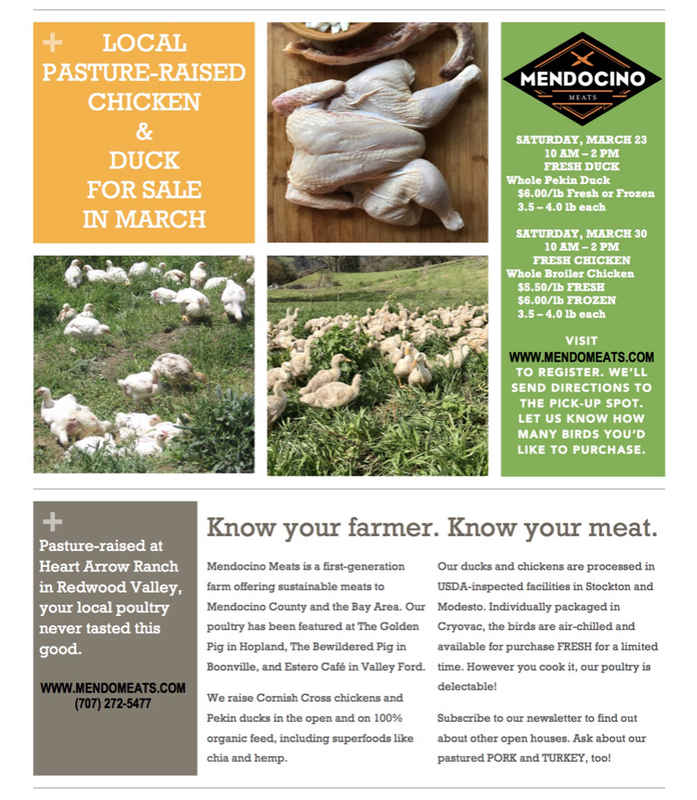 Mendocino Meats is a first-generation farm offering sustainable meats to Mendocino County and the Bay Area. Our poultry has been featured at The Golden Pig in Hopland, The Bewildered Pig in Boonville, and Estero Cafe in Valley Ford. We raise Cornish Cross chickens and Pekin ducks in the open and on 100% organic feed, including superfoods like chia and hemp. Our ducks and chickens are processed in USDA-inspected facilities in Stockton and Modesto. Individually packaged in Cryovac, the birds are air-chilled and available for purchase FRESH for a limited time. However you cook it, our poultry is delectable! Subscribe to our newsletter www.MendoMeats.com to find out about other open houses. Ask about our pastured PORK and TURKEY, too! We would like to grow flowers, veggies, culinary herbs and other food crops. Rustic/off grid fine. We have pictures of previous gardens. Cabin, cottage, yurt, efficient house with garden/farm space. (Coast/Anderson Valley) :) Skillset includes: Planting, Harvesting, Orchard Care, bees wax candle making, Growing Plant Starts (Edible Flowers, Herbs, Veggies and Fruits), mulching, weeding, animal husbandry and more.